Probably the first thing people think when they imagine Hawaii is an expansive stretch of one lovely beach after another. It's true that there are beaches to suit everyone on each of Hawaii's beautiful islands, but one thing we have learned after visiting Oahu, Maui, and the Big Island is that not all beaches are created equally. It takes months to really pinpoint the best beaches in any given spot and in Hawaii the same is true. But in Hawaii there are about a thousand beaches to search through. 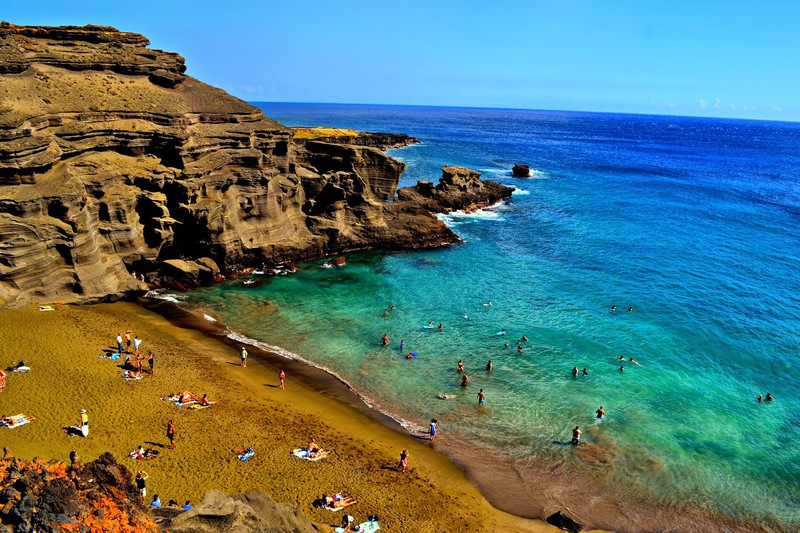 I've already covered our favorite beaches on Oahu and now after spending over a year here (as it turns out, there are many timeshare opportunities), Expedia asked me to come up with what we believe to be the 5 best beaches on the Big Island of Hawaii. Makalewena is by far the very best beach on this island and really it rivals any beach on any of the islands of Hawaii. The thing that makes it so special is also the thing that makes it a bit difficult...seclusion. You will oftentimes be the only one on this beach but even on a busy day it still feels rather secluded and offers plenty of private space. To reach this Kona side beach you will either need to do a moderate hike in or drive on a truly horrible 4x4 road. We have done both and neither will be quick so it really just depends on where your comfort lies. The hike is about 40 minutes in direct sunlight. It is flat but is on a very rough lava rock path. Think sprained ankle central. Not so bad hiking in but after a long day in the sun I can think of better ways to spend 45 minutes. The drive took about 30 minutes and is a tough one on any car. Be sure you have good clearance and drive slowly! 4x4 was definitely necessary especially on the way out. What we love: Simply put it is one of the most beautiful beaches I think I have ever seen. Powdery white sand, beautiful turquoise waters, just the right amount of wave action, and loads of shade up on and near the sand dunes are just the beginning of a long list of what there is to love. What we don't love: The hike or drive in are brutal and the fact that there are no bathrooms or showers can be somewhat irritating. The Green Sand beach, located on the South shore of the island is also a bit difficult to get to. It is a remote beach on a very rough stretch of road but worth every bit of effort to get to. The sand may not be bright green but it is stunning and one of the more unique beaches we've encountered. It really is a black sand beach that over time, due to erosion, has been mixed with small pieces of olivine, giving it the green hue. If you look hard enough you can even find some larger pieces perfect for jewelry. Your options for reaching the beach are similar to Makalewena. You can hike in but it is also in direct sunlight and well over 3 miles each way. You can also drive in if you have 4x4, good clearance and no regard for the general state of your car (this road is about 10x worse and harder to navigate that the road to Makalewena, and that's saying something), or you can pay one of the locals at the start of the hike to drive you in for a small fee. What we love: The simplicity to the area, the unique sand, the beautiful warm water, and the small caves and rock outcroppings perfect for exploring. What we don't love: The drive or hike in, the fact that there are no bathrooms or showers, and the steep hill needed to climb down and back up in order to reach the actual beach. Kua Bay is a lovely little Kona side beach. As you approach you marvel at the colors of the sea and are thrilled when you realize that it is the exact spot you are heading to. This beach is far more accessible than the 2 previously mentioned. You drive right up, park by the bathrooms and head right onto the beach. It is a little more crowded but on the weekdays it is never too bad. What we love: The accessibility, the bathrooms and showers for rinsing off, and the beauty of it all. What we don't love: The waves and currents can sometimes be a bit too much, even for my family who love playing in the surf. Also in the winter there is a lot of beach erosion and sometimes, like this year, the beach is almost completely gone. It comes back but that is a definite negative. 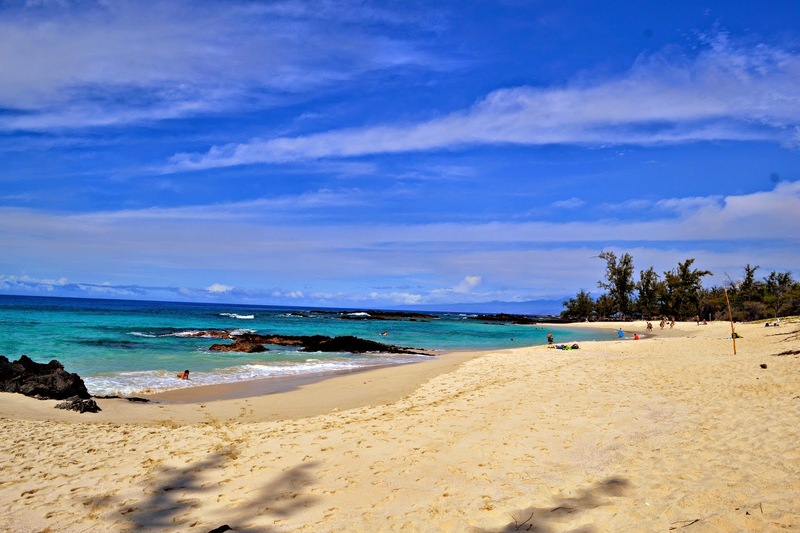 Kahalu'u is also a Kona side beach but it is far different than the others in the list. It truly is a, something for everyone, type of spot. There are lovely tide pools that keep even the youngest beach goers safe, a turtle conservation group almost always present teaching kids and adults about the turtles and other sea life encountered there, and even a area where the surf is just perfect for beginning surfers. It is also very accessible with a large parking lot, picnic area, food stand, and loads of showers and bathrooms. What we love: The snorkeling here is incredible, some of the largest and most colorful fish we have seen in all of Hawaii. We also love the facilities, ability for my oldest to surf while the rest of us snorkel, swimming with sea turtles, and the fact that you can get a drink and snack right there. What we don't love: This is no white sand beach, its more pebbly and not so soft on your toes. Also because it is so accessible and offers so many great amenities it is far more crowded than any other beach on the list. 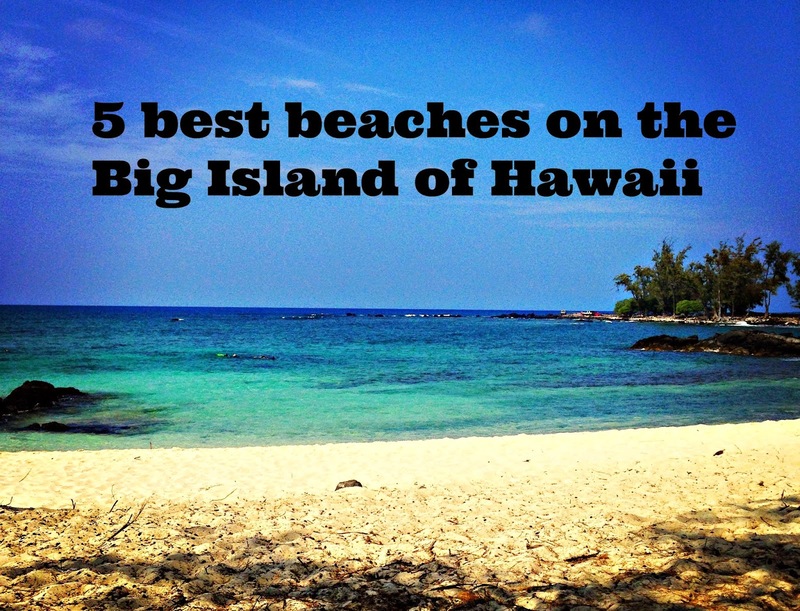 Carl Smith is the only Hilo side beach that made the list for us. It is located directly in Hilo and although the water is super chilly it is just beautiful. It is a perfect spot for picnicking, watching whales (in the winter), and most notably swimming with the friendliest sea turtles around. The beach also offers nice bathrooms, plenty of shade and picnic spots, as well as showers for rinsing off. There is also a lot of lava rock and coral making for decent snorkeling as long as the water is calm, which is usually is. What we love: SEA TURTLES!! Seriously they get so close . You are not supposed to touch the turtles or interfere with them at all really but at this beach there is no avoiding it, they swim right up onto you! What we don't love: The water is somewhat chilly and there is no beach to speak of although once you get in the bottom is nice and sandy. The parking is also a bit dodgy as you just park on the side of the road. Be careful if the traffic is heavy. There are tons of beaches that could make any top 5 list here in Hawaii but these are by far the ones we visit most often. Honorable mention goes to Honoli'i on the Hilo side, a great spot for surfing and also a great spot for the littles to play. 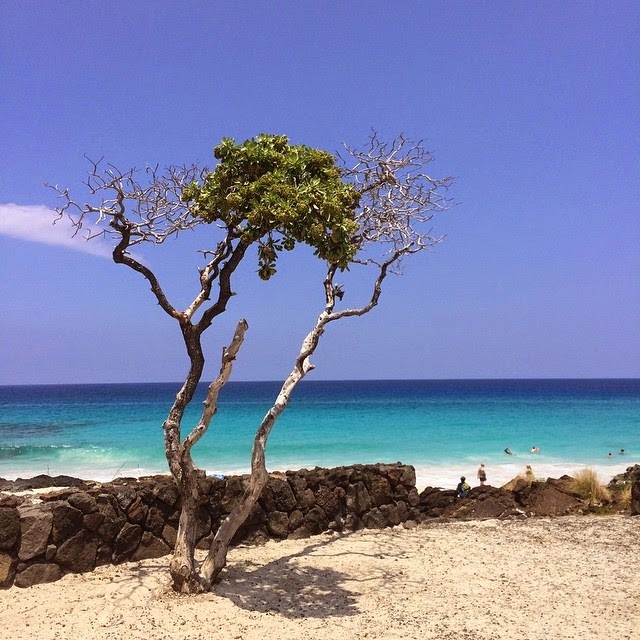 And also to both Hapuna beach and Mauna Kea beach located on the Kona side, both with lovely amenities, long stretches of white sand, and relaxing waters. Last but not least, it can be important to know the local medical emergency scene when exploring new places. You never know what could occur during a fun day on the beach. Of course, you can always get medical help by calling 911, but dental is another story. There's an emergency dental site that can help with that sort of thing if you have a dental emergency you can find a local dentist at Emergency Dentists USA. Have you been to the Big Island? Which beaches would make your top 5 list? I'd love to hear about them in the comments below! Seclusion! That one is big to me, so the secluded beaches above work best for old RB lol....the beauty is stunning. Hawaii is just chock full of pristine beaches. As for the surf you must be vigilant because it can turn in a second. I recall almost being swept out when swimming at Nai Harn Beach in Phuket. Scary! Awesome images Mary! Tweeting and Pinning from Bali. Yeah we feel the same way. That's one of the great things on this island. A lot of the beaches offer decent seclusion. That does sound scary. We are pretty adept in the ocean, even my youngest. Just need to know what to do in the event of a riptide or strong current. First step...don't panic:) Thanks for the love Ryan! Lovely pictures of a beautiful place. I haven't made it there yet but I'm looking forward to heading there myself. Thanks for the inspiration! I've always been enchanted by Hawaii, although never actually visited. Being a marine biologist, I'm sure I'd find so much interesting to see there! Those sea turtles sound amazing! I've been to Oahu and absolutely loved all the beaches there (minus the parking situations). I can only imagine how lovely they must be on the other less inhabited/visited islands! Getting back and exploring more is definitely on my list of things to do soon! It's always good to have the inside scoop when you're contemplating a visit. This is a great introduction for folks visiting the Big Island for the first time, or those who are returning and may have missed one! Yeah you can have it all here in Hawaii. Especially this island. I love the diversity! No problem and be sure to get in touch if you do come out. Sea turtles are one of the things we love most here. That and whales:) This island has definitely been the best of them all for turtle action. We love it here but also miss the great Oahu beaches. We lived there for 8 months and went to the beach nearly everyday and still didn't hit them all! Thanks! I always want to know the insiders top picks. When you only visit for a week or 2 that's not really a great guide to the best beaches, when you live someplace you can really explore them all and share! I figured after a year it was time. Yes please do and look me up if and when you do come out. Keep trying to leave but keep staying so who knows when we'll move on! Oh my goodness, the beaches are incredible! We have yet to visit Hawaii but would love to sometimes soon since it's not too long of a flight from Portland, OR. I think I would like that first beach best because of how secluded it is. I still haven't made it to Hawaii, which is insane looking at these amazing beaches. 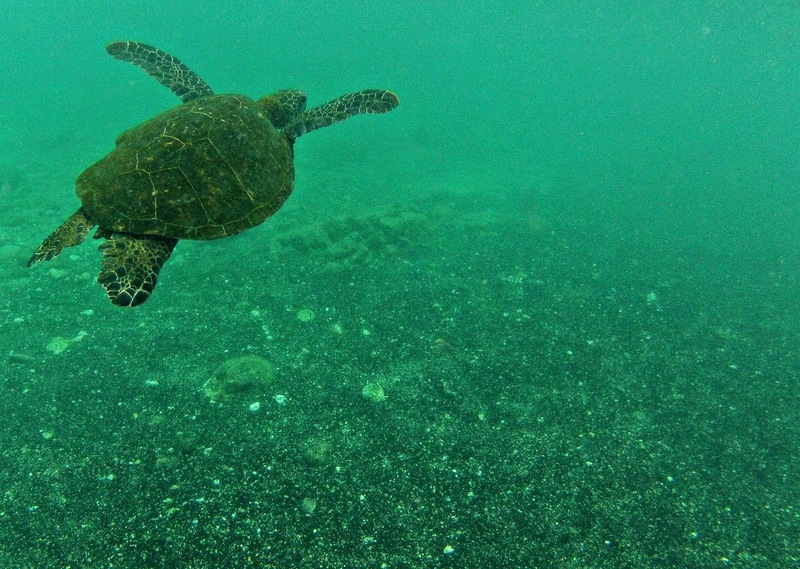 I love snorkelling and watching sea turtles and other sealife. I think I'd also love the first beach, it looks like a picture postcard. Great post and photos! Yes that's part of why we love it. After living in Costa Rica and having so much quiet at the beaches there we really prefer that. The flights are pretty cheap from Portland! we LOVED Green Sand Beach but yes, it was quite the hike out there. We also went to a black sand beach on the Big Island that was great too. I can't remember the other one's name but it means "Place of Refuge". (I believe it was towards the south side) We were snorkeling quite a ways from the shore but we were able to snorkel right next to the dolphins! Beats paying $$$ to spend 20 minutes in a tank with them anyday! Yes that is what locals call 2 step and its quite common to swim with dolphins there. Its really beautiful. Punalu'u is lovely too on the South side with a nice black sand. It was a hard post to write as its nearly impossible to only pick 5 beaches here:) And I agree about dolphins in a tank, such an un natural experience and you know the dolphins are suffering. Wild animal experiences are so much better for everyone!